I love meeting other bloggers for the first time. It’s like you already know the person, have seen their photo yet have never met in person. So when they walk through the door, you can spot them [assuming their photo they posted wasn’t a venture in Photoshopping] and give them a hug or handshake. 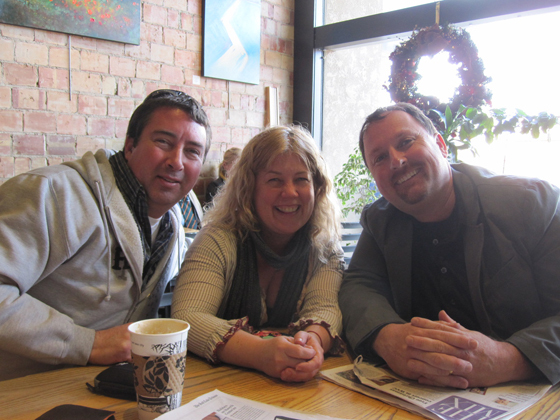 The recent meetup with Naked Jen and Troy Pattee was one of those events. I first knew about Jen a couple of years ago after Karl went to BlogHer and took photos. Yes, there were shots of Jen in all of her natural self. But her version of naked is not the same as the rest of the Interwebs. It’s all about being down to earth and being comfortable with yourself. Month’s later, she’s on Karl’s radio show and I happen to be logged in. Imagine my surprise when I find out she lives here in Salt Lake. “Damn, we need to meet up” I thought to myself. Well, many [and I mean MANY] months later and several tweets attempting to set a date and time, we finally met up. Jen’s overall vibe and aura was evident. I really felt a sense of meeting someone that is genuine and easy going. And she wasn’t rushed or anything, which is something I always crave in life. I started following Troy on Twitter after seeing him in Jen’s twitter feed. After reading a few of Troy’s tweets, I admit to being extra curious what “MomItForward” was all about. This link helped, but it was nice to hear the real story in person. Turns out Troy is a marketing guy (the nice kind) that has helped build a positive social networking site. They do this thing on Twitter once a week called “Girl’s Night Out” using the hashtag of #gno. While I admit to seeing tons of tweets and re-tweets and wondering “Boy, they sure tweet a lot”, reading more details on this show that they do giveaways each week and post questions concerning family matters. Pretty cool. It was an enjoyable 2 hours and I can’t wait until we meet up again. I promise to do my best to clear my schedule. Meeting bloggers really is cool! Great picture! Someday, we’re going to meet, and we’re going to drink ’til we puke, and I’m totally getting shots of it. Oh you know it. And I so want to try and drink you under the table. I know I may fail, but I’ll have fun trying. Very cool that you got to meet up with them. The very first time I saw Naked Jen, she was totally naked! Ah, BlogHer…good times. When you had her as a guest on your radio show and I found out she lived her locally, I had plans to meet her in person. And I finally did. Took me damn long enough, but it was worth the wait. I wish you could have too. Next time you visit, we’ll have to schedule a meet up with everyone.